Sleaze Roxx: Congratulations on the release of Mach22’s new EP ‘Working Off The Clock.’ I have to confess that as happy as I was to see that Mach22 were releasing a new EP, I was disappointed that there are only three songs on the EP. Why did you guys decide on just releasing three songs on the EP? Damian MonteCarlo: Well, the plan for us is to release as much material as possible this year and to release new music frequently. We have about three more songs ready to go, which we hope to record and release in the spring; probably a few more in the summer, fall, etc. We want to release songs as we write them throughout the year to stay in people’s faces and stay active. The days of releasing full length albums are pretty much over in my opinion. Most people these days don’t have the attention span to listen to eight or ten tracks at once. We’d rather give you a few at a time, every couple months or so. Sleaze Roxx: Did you guys feel any pressure in following up ‘Like My Chances’ which I thought was an absolutely phenomenal album? Damian MonteCarlo: Thanks! We always wanna do our best and won’t put anything out there that we don’t believe in. We always try to raise the bar for ourselves with everything we do. We felt that these tunes were right up there with the others, and wanna take it to the next level. 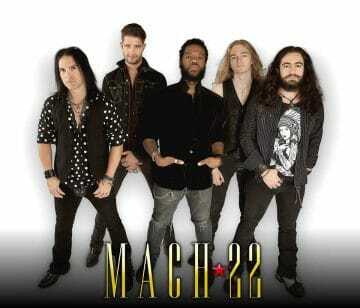 Sleaze Roxx: From an outsider’s perspective, it seems that Mach22 seemed to be for lack of better term on a bit of a lull until the group won the opening slot for Guns N’ Roses in Philadelphia in July 2016, which really seemed to rejuvenate the band. 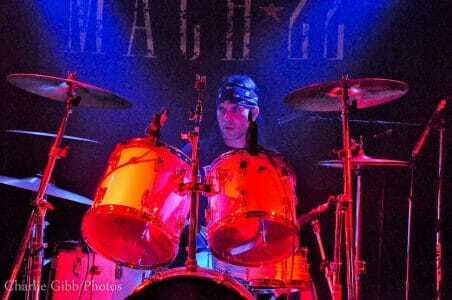 For that show, Mach22 reunited with bassist Jaron Gulino and it seemed that Ric Haas was added to the line-up. Do you agree with my assessment and how did Jaron rejoin and Ric join the band? Damian MonteCarlo: Yeah, well we weren’t that active for the first three months of 2016. Just kinda took some time off to recharge the batteries. We had some great gigs in the spring such as opening for Tom Keifer in our hometown of Philadelphia and some out of state gigs. In the spring, we decided that we wanted to add a second guitar player and Ric was someone we had our eyes on. He’s young, hungry, brings great energy to the band and is a phenomenal guitar player. We never wanted Jaron to leave the band but he just needed a break. He’s one of my best friends and we always stayed in touch and he expressed interest in returning just before the summer time. When the Guns thing came up it was a no brainer for him to return. The timing couldn’t have been more perfect. 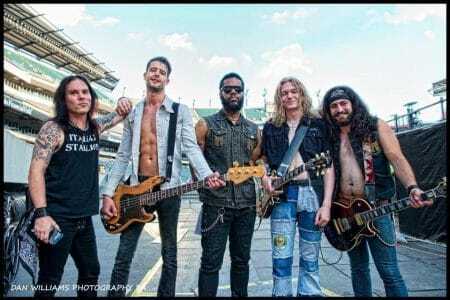 Sleaze Roxx: How was the experience of opening for Guns N’ Roses in such a big stadium as the Lincoln Financial Field [in Philadelphia, Pennsylvania, USA]? On the downside, it seemed from the various photos that Mach22 went on really early and many fans had yet to arrive into the building. Damian MonteCarlo: It was such an amazing experience! The entire week leading up to it was probably the greatest week of my life. It was something I will never forget. We felt like Rocky Balboa getting ready for his fight with Apollo, with the entire city rallying behind us. I could have never imagined being on a stage that size, but we all felt really comfortable being there. We were treated as equals. We had full range of the stage, everywhere except the ramps behind us, got a soundcheck, ate filet mignon at the band catering dinner, had a locker room with showers for a dressing room, booze etc…. Amazing [laughs]! Anytime you’re an opening act, chances are you’re not going to play for a capacity crowd. That place holds over 50,000 people and though there may have been 5,000 or 6,000 people and looked empty, it’s still the largest crowd we’ve ever played in front of and the crowd was still loud and very receptive. If you put 5,000 or so people in a stadium that size it’s gonna look like 50. It didn’t really change the way we felt or played. Whether we’re playing in front of five, 5,000 or 50,000, we’re still gonna rock your faces off. It was great seeing so many people there with Mach22 shirts on. When we finished playing, we all walked out into the crowd and were greeted by fans and friends. We felt like we won the Super Bowl or something. It’s quite an honor to open up for your heroes, especially a legendary band such as Guns N’ Roses and very special since we were the only unsigned band to open for them on this tour. We’re very grateful for that opportunity. Sleaze Roxx: Did you guys get to meet anyone in Guns N’ Roses that night? If so, how was that experience? Damian MonteCarlo: We did not. When we arrived at the venue, Guns N’ Roses were doing their soundcheck. They split immediately after and then we unloaded all our gear and got settled into our dressing room. There was just so much going on. I did see the band as they walked off stage at the end of the night but didn’t get the chance to say “Thanks for the opportunity.” We were invited to their New York City shows, not to play but they hooked us up with great seats and passes. Sleaze Roxx: Bassist Chris Seeland ended up only being in Mach22 for less than a year both on official and unofficial basis. Why didn’t it work out with Chris? Damian MonteCarlo: Chris was filling in for us for while we were looking for a replacement for Jaron. He was a great player and knew the tunes well so it made sense at that time to ask him to join. No disrespect to him but we just didn’t have the chemistry that we had with Jaron. Many bands experience this. Jaron was in the band for about four years and was a huge part of the band’s success. We shared so much together. It’s just impossible to replace someone like that. 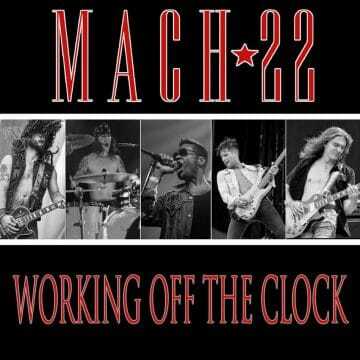 Sleaze Roxx: Mach22’s ‘Working Off The Clock’ has only been released in digital format at this time. Are you planning on releasing it in physical format soon? Damian MonteCarlo: Yeah, we’ll definitely release a physical copy soon with the next batch of songs in the spring so it will be a five or six song EP. Sleaze Roxx: Why did the band end up choosing the song “Stuck In My Head” as the first single and video from the new EP? Damian MonteCarlo: It’s just a great “kick your teeth in” kinda song that makes a statement. “We’re Mach22 and this is what we do.” We’ve gotten great feedback from it from the first time we played it a few months ago. That song came together really quickly and was pretty much written in the studio, which was something we never did before. Sleaze Roxx: How did you guys come up with the EP title ‘Working Off The Clock’? Damian MonteCarlo: It’s actually a line in “Stuck In My Head” and it kinda made sense since that’s what we’re currently doing… Working our tails off. Sleaze Roxx: What are Mach22’s remaining plans for 2017? 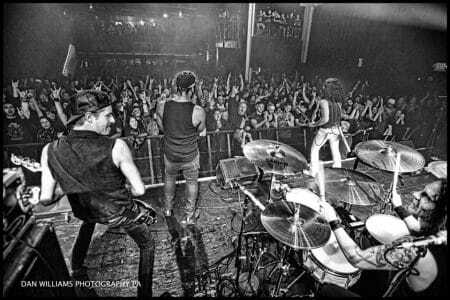 Damian MonteCarlo: We’re currently writing new material and hope to record these new songs very soon to release in the spring. In between, we will continue to play shows on the East Coast and release another video or two. Hopefully we get picked to open for Bon Jovi in March which would be absolutely incredible! Sleaze Roxx: You are also in another band called The Riots. How did you end up hooking up with that band? 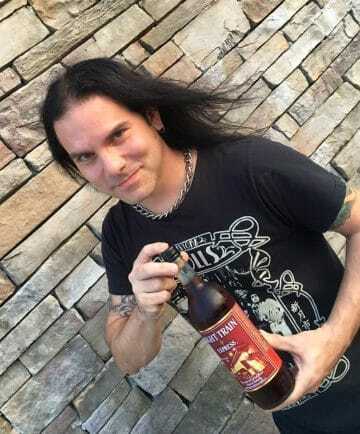 Damian MonteCarlo: I started that band with Eddie Thomas in late 2015 because I was looking to do a side project that was totally different than Mach22, something faster and punky. It just got to the point where they wanted to gig a lot and I felt like I was holding them back so I had to leave. I left in November . Sleaze Roxx: How was it juggling two bands at once? Damian MonteCarlo: I actually play in another original band called the Nasty Things which is based in New York City. It features Eric Jayk from Wildstreet on bass and Jonny Dambrosio from Acey Slade’s band and he also played Johnny Thunders in HBO’s show Vinyl. He’s on guitar and vocals. It’s a pretty cool rock n’ roll band if you’re into old Mötley Crüe / Hanoi Rocks. I just love to play and keep myself busy. I’ll play in a hundred bands as long as it doesn’t interfere with Mach22. Sleaze Roxx: Is there anything that we haven’t covered that you’d like to mention? Damian MonteCarlo: If you’d like to download ‘Working Off the Clock’ you can do so via iTunes or Amazon [see links below]. Sleaze Roxx: Last question — what are your top three favorite albums of all-time and why? Damian MonteCarlo: Oh man! This is such a tough question and it changes all the time. If I have to pick three albums that have had the strongest impact on me, it would go like this. First, Bon Jovi’s ‘Slippery When Wet’ because it was the first rock record I ever owned and it was then when I knew what I wanted to do for the rest of my life… I wanted to see a million faces and rock them all! Second would be Cinderella’s ‘Night Songs’ ’cause they were like the first hard rock band I ever saw on MTV. When I found out they were from my backyard, it made me think that, “Hey! If these guys can make it outta Philly and become rock stars, then maybe I can too?” It’s possible to turn your dreams into reality. Third would be Guns N’ Roses’ ‘Appetite For Destruction.’ It’s probably the greatest debut album of all time and the first song I ever learned on the drums was “Welcome To The Jungle.” Steven Adler will always be my favorite drummer because of this record. It’s perfection.